The teams at the museum are diverse groups of people. We have some full time staff that administer and manage the museum plus a professional catering team that creates the food visitors enjoy in our NAAFI style restaurant. But the majority of the Museum team are volunteers who offer their time and skills to ensure that the museum continues to operate, bringing a combination of engineering skills, stewardship and guiding, specialist archive knowledge and even firefighting skills. It’s not often that such a combination of people are together in one place for very long, but each year, the museum Christmas Lunch is a suitable occasion to gather together and share a meal at the end of a busy year. 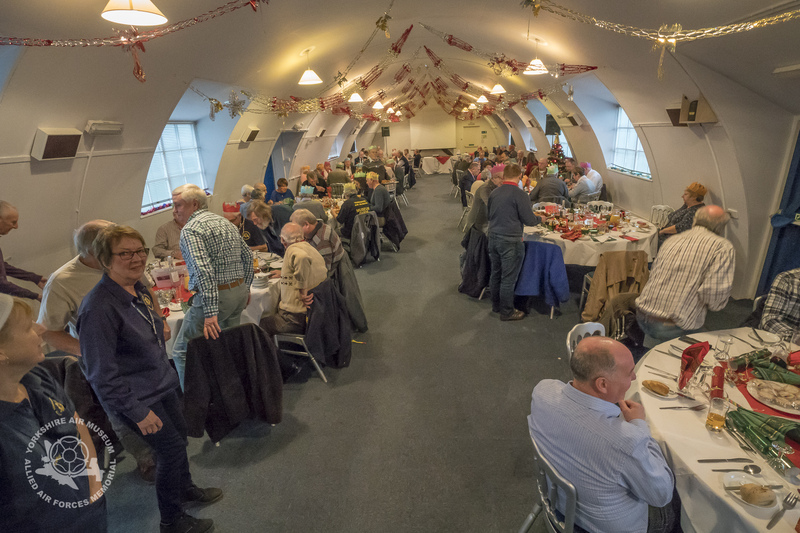 Almost everyone who is able to, gathers in the Elvington Room to enjoy a traditional Christmas lunch. Of course, if you are going to prepare Christmas lunch for more than one hundred people, someone has to serve the food. So while everyone else enjoys lunch, our NAAFI catering team waited until everyone else was served before sitting down themselves, something greatly appreciated by everyone. Afterwards, we enjoyed coffee and a chance to see a collection of some of the video and images from 2016. It’s been another busy year for the Museum, with lots of hard work behind the scenes bringing new attractions such as the Gasbags to Super Zeppelins exhibition and displaying our AVRO 504 at the Somme commemorations at Thiepval plus, of course the continuing preparations for the arrival of our new exhibit, the Mirage IV nuclear bomber. 2017 promises to be another busy year with new exhibits, new events and hopefully, even more visitors than ever. The Museum has supporters across the world, so for those who were unable to be present, here’s a gallery of pictures from this year’s lunch, plus the video compilation from 2016 to remind us all of the busy year we’ve had. 2016 at the Yorkshire Air Museum from Yorkshire Air Museum on Vimeo. The entire Museum team would like to thank everyone who has visited and supported the Museum this year. It is thanks to our visitors, sponsors and members that the Museum is able to continue it’s work. We wish everyone a peaceful Christmas and a Happy New Year.